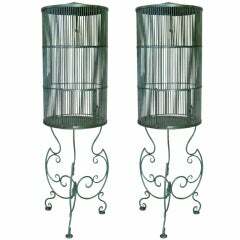 Pair of iron garden obelisks. Pair of giant white obelisks with a lattice pattern structure, standing on four balls forming a square base. 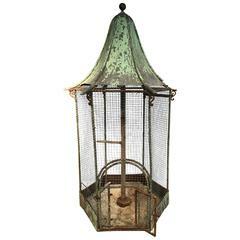 Pair of French style cast iron garden urns in red patina. 1990s pair of malachite over wooden frame obelisks. This stylish set of Egyptian Revival marble obelisks date to the 1920s-1930s and were acquired from a Palm Beach estate. The pieces are fabricated in black and mustard colored marbles. 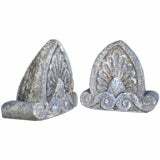 Pair of 19th century, Spanish colonial, decorative carved stone corbels with beautiful mossy patina in a fleur de lis design. Can be used as bookends or as a garden accessory. 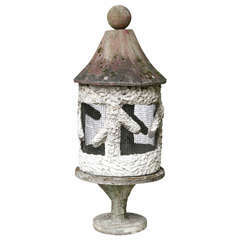 Faux bois style cement birdcage.